Fasting amplifies personal valuation of food. I did a liquid, raw food experiment in January. It was great in the beginning. After two weeks it felt unnatural. Although I adore berry and fruit smoothies, and have kept the habit of drinking them for breakfast, I ran into trouble with vegetable ones. The powerful, mechanical process of blending carrots, beets, broccoli or other veggies seemed to alter their constitution and violate the natural order of human diet. Soon I wasn’t able to swallow them, even when they tasted pleasant and vital. The attempt turned into a psychological warfare. My need for texture became overbearing. I wanted to bite and chew. And to taste the subtle transformation vegetables go though in the process of cooking; whether steamed, braised, fried or roasted. What started as an innocent contemplation of eggplant, turned into an obsession! I’ve never had a favourite vegetable, and even if I had, it wasn’t eggplant. It can offer a dreadful culinary disappointment if not well prepared: some of you may have gagged when a slimy, undefined lump of eggplant has clung on the throat. I have. But now, gone are the days I could only enjoy crisp, fried eggplants. For the past month I’ve cooked them in large quantities and ways. There isn’t a dish I dislike. For the simple reason of being most photogenic, I’m sharing an easy recipe of oven roasted eggplants. By now you must’ve noticed I roast everything, ad nauseam! Gradually I will post recipes of other cooking methods, too. I promise, ok? Serve with airy, light potato mash garnished with fried chili and ginger in ghee for your ultimate satisfaction. Crown your lunch with fresh lettuce, lime and herbs! Bon appetite! What gorgeous food and photography! So happy to find a new recipe here today! Your beautiful blog brings so much joy to the eyes, heart and mind. Wonderful photos, as always!!! I look forward to seeing your photos everytime! I have to agree with you about juice fasting. I can only do it if I eat one light meal at the end of each day and drink juices for the rest of the day! I also love eggplants and they are certainly a staple at my house, especially now when they are in season! I have eggplant growing in my kitchen garden too! This sounds delicious! Beautiful post and blog. One of my favorite recipes for eggplant is grilled with black bean sauce. I have a fondness for roasted eggplant and am charmed by your recipe. Your photos are a journey with a delicious destination! Great styling Lakshmi! Have to agree that eggplant is always great grilled (love that smoky flavour). Your posts are always a treat to the eyes and tastebuds, love your site! I would like this recipe but why do I have to register on google to see it? Your recipes and photographs never fail to amaze me! Seriously--this all looks like a beautiful combination of flavors. The photographs and how the simple turns elegant in your recipes blows my breath away every single time. I love eggplants, this vegetable with tomato and potato are a top of my list! I love everything roasted too. Well done! Thank you for stopping by. Eggplants seem to be either liked or hated. I imagine kids especially being suspicious about them! Maria, lucky kitchen gardener! Please send us some Sydney warmth and sun here, too. Anonymous, you don't have to sign-in in order to view the recipe. Just follow the link. It is a public document. You know for an eggplant lover this really looks heavenly! 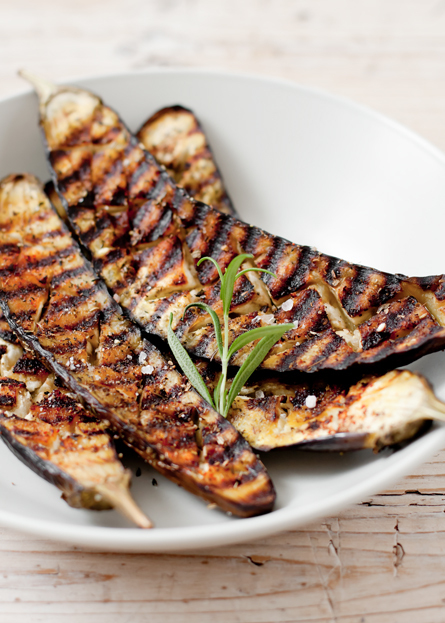 I can pretty much eat eggplant in any form and grilled or roasted is absolutely delicious! Gorgeous pics Lakshmi and yes they happen to be my favorite too ;-)...sometimes I grill them and make a lasagna (tomato sauce)without pasta!! This is an exciting eggplant dish. Excited to try this out! From the placing of different elements (ingredients and cooked food), the direction, the colours, the angle- everything is just perfect. ALso,eggplant is my favourite vegetable right from my childhood. I love it in all forms, mashed, fried, roasted and chopped. Lakshmi u r magician. No the truth is u r extremely talented. Eggplant can be so hard to photograph but u did marvelous job. I pretty much roast everything too. Have been thinking of a raw diet for a while! Debugcooking - I love the idea of lasagna with eggplant and WITHOUT pasta! Genius :-)! Raw diet is good as a temporary boost. It is powerful and gives a lot of energy. You experience prana, vitality, of fruits and vegetables fully. It is more suitable for certain constitutions than others. I know many people who permanently live & thrive on it. It doesn't resonate that well with me. Beautiful photos! And I love me some eggplant! I have always loved eggplant, and as I get older, I do believe that love has deepened even more. It's versatility, it's texture, the varying hues - it's just a beautiful vegetable! Your dish and photographs are just beautiful, Lakshmi. Aww Lakshmi....such a joy everytime you post something. I grill mine on a skillet....eaten with chapati and dal....perhaps ill blog about it! yum yum! And trust me mashed potatoes never looked so stunning ever before. I have only recently discovered your beautiful blog and I last night I tried the roasted eggplants for dinner. I have never been particularly fond of eggplants, but I am on a diet now and must eat plenty of vegetables, either raw or cooked in the healthiest way possible. It was delicious! Thank you for making me discover and appreciate new tastes. The photos are spectacular. Gaby, I'm glad to hear you liked the eggplants! Thank you for sharing. Lakshmi, you have a gift to make simple things look exotic... A breathtaking feast for the eyes! Every now and then I contemplate on doing a juice cleanse as it feels like the right thing to do, haven't acted upon yet. Eggplants are my all time favorite, have not tried them grilled or sliced and roasted though. And, thank you for stopping by.. It always brings a smile to my face.. I'm a huge fan of your beautiful cooking photos and styling. Eggplant is a staple in our home, but I've only made curries. I will try this soon! Wow, every post is a feast for the eye, here! Your photos are awesome, and 'purely' dreamy and magical!As for this recipe, I love baked aubergines too, though I cook them mostly in summer, when they are in season, here in Italy. I am a new reader and I am just obsessed! I love your blog and aspire to be as "with it" as you one day! 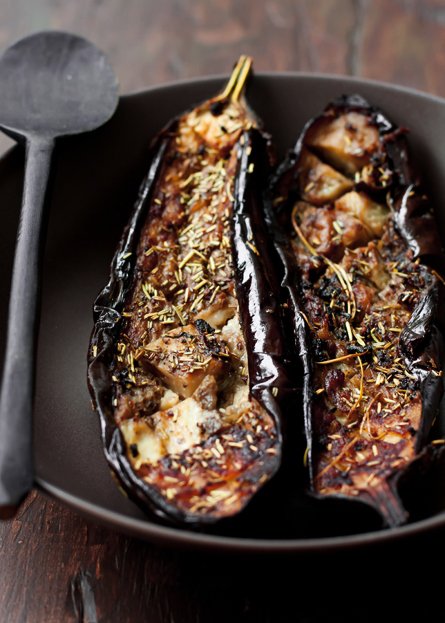 You must try eggplants roasted on a charcoal fire - you will be amazed at the enhancement, even if you already love them! I suddenly understood how they became a staple in the desert cultures of the world, where open fire cooking is the norm. They're delicious! Your recipe included olive oil. I was surprised. I thought you were roasting everything WITHOUT oil!